This entry is cross posted from my TSSG blog. So with the Pouzin Society meeting coming to a close I took the short train ride over to Ghent for the FIA activities. The assembly is quite big now as compared to FIA Madrid and there were tons of interesting sessions however I spent most of my time in the FIA session II: Smart Infrastructures and FIA session V: Architecture Group. Then came the great news that Panlab II had won the Future Internet prize for the best European Future Internet initiative. Wow a great success for the PII team, and especially those in the TSSG which included Eamonn, Shane and Zohra. Their work focused on PII resource repository, which was implemented using a REST style architecture, the full design of which can be seen below. D3.1 System Analysis where a list of the Panlab Community testbeds are maintained and the resources from those testbeds providing PII components are described in UML [pdf]. D3.2 Testbed Service Description Specification in which the specification of the service description system is given. Also requirements are broken down into more refined technical requirements for the specification of the PII testbed services description system [pdf]. D3.7 Implementation Report in which the Service Description, Service Discovery and Service Orchestration of the PII testbed is given. This document also reports on the extensive implementation efforts realised by WP3 PII partners delivering a functional PII framework [pdf]. D4.2 Monitoring requirements and procedures for service level agreement compliance has the functional specification of PII’s quality assurance framework, which hosts the metrics and processes for quality assurance in the PII framework [pdf]. Eamonn Power, Zohra Boudjemil and Shane Fox. Architecture and Implementation of a Testbeds Repository [pdf]. International Conference on Telecommunications and Multimedia (TEMU) 2010, Chania, Crete, Greece, July 2010. I’m delighted to see that Eamonn, Shane’s and Zohra’s work has been recognised. Brussels in December is cold but then again this last week in Ireland (Dec 2010) hasn’t been a walk in the park and really I’ve been so lucky to be traveling after all the snow storms have passed. I was also lucky enough to be traveling with Patsy who kept us all in good spirits during the trip, irrespective of the wintry conditions. Anyway this trip to Brussels was for the first European meeting of the Pouzin Society hosted in Boston University offices. Yes you read that right Boston University hosts some programmes in Europe. community, and to bring them up to speed on the progress the Pouzin Society, of PNA / RINA and to provide a status update on the current demonstrator of RINA. The initial session of the meeting was given over to Patsy who provided a light tutorial of RINA, and a presentation of the current demonstrator of RINA (OpenTinos). Further to that Eduard gave an overview of the DTP and CDAP specifications. John and Steve conferenced in via Skype for the next session which was devoted to the logistics and location of a possible workshop in Europe for Q3-Q4 of 2011. 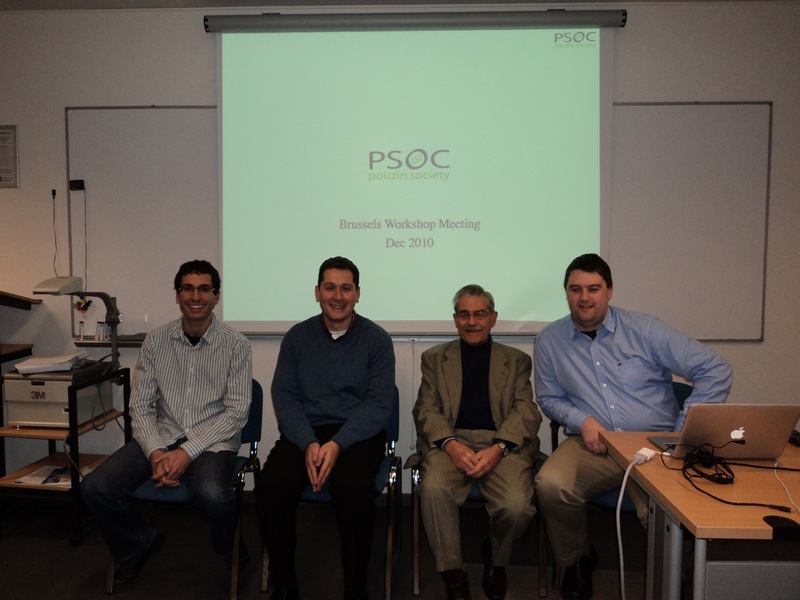 The next session during the meeting was given to a discussion on the marketing of PSOC through 2011, with a look at the possible online and offline presence of the society. The next session was dedicated to the possible strategies towards member state national funding and EU funding of research with targeted deadlines in Aug 2011 and Jan 2012. There was a final session devoted to invited guests (EC) to give them an opportunity a listen in and to also present to the society. Full minutes and presentations from the meeting can be found at the PSOC yahoo tech group (requires registration). Now I have to say the biggest trill of the trip was getting the chance to talk with Louis Pouzin the Grandfather of the Internet. Louis was so kind to give us all a run down of his experience and the reasons why and how he designed the networking systems he was involved in. Louis is now the oldest software hacker I know! The answer from Louis drew an hilarious response which I’m only really willing to repeat when I see you in person. Finally for those who may not know how important Louis’s work has been to the current Internet as we know it, have a little look at this video just replace 2009, with 2011, 2012, or whatever year you’re in now, the history part still rings true.